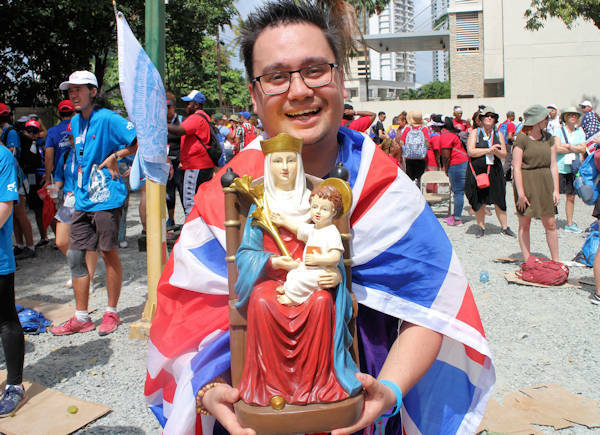 On Day Three of World Youth Day in Panama the East Anglia group attended their first catchesis teaching session, talked about Our Lady of Walsingham and experienced Latin American culture. Jess McCall reports. Today we had our first day of catchesis (teaching session) in English with Bishop Burns from the USA. He spoke on the Bible quote “speak Lord your servant is listening”. He talked about how we should put down our electronic gadgets for a while and listen to God, listen to what he is asking us to do, and where he is guiding us, so that we can say yes to God! We had lots of interest in the statue of Our Lady of Walsingham today with particular interest from some Canadian and some American groups. They really enjoyed the opportunity to take pictures with her and to learn about her. They were all shocked to hear that people had been visiting the shrine in Walsingham for so many years. 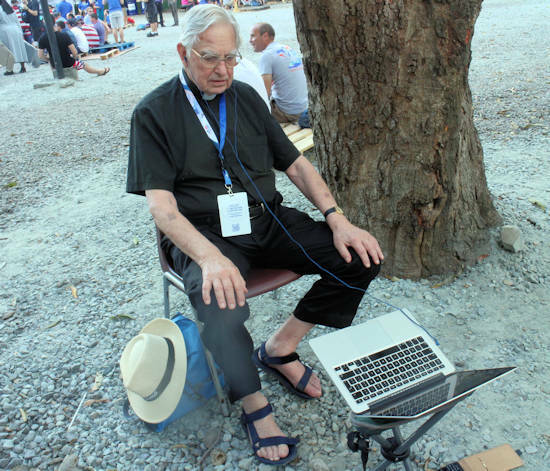 Fr Michael Johnstone was asked to do a live interview on Premier Christian Radio in London via Skype (pictured right), talking about being on the oldest pilgrims at World Youth Day at the age of 85. There were no main events on this evening so we had the opportunity to go to different events and sample some Latin American Culture. We chose to go to a stage where there was a dancer and a band singing in Spanish – it was really amazing to see some of the traditional culture. At the end of the evening we stopped by a beautiful looking church just to have a look and it turns out that Adoration was taking place inside. The atmosphere in the church was amazing and the whole experience was peaceful and refreshing. It was really great to be able to spend some time with God in silence listening to what he had to say – just as Bishop Burns had spoken about during catechesis in the morning. 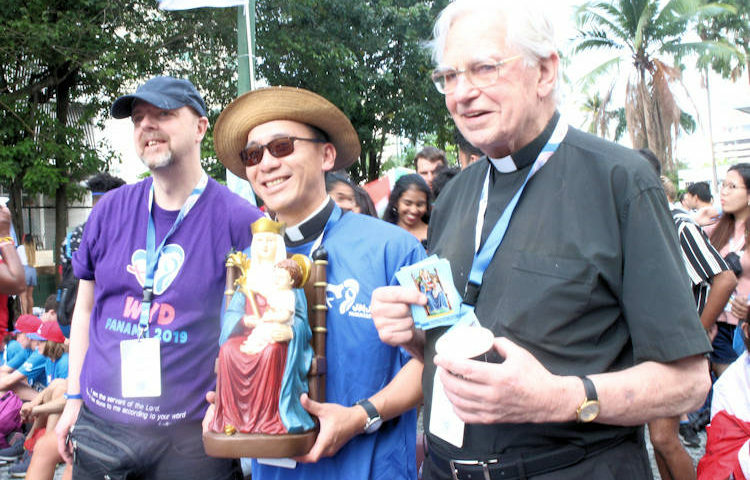 Pictured top are Hamish MacQueen and Fr Michael Johstone posing for pictures with Our Lady of Walsingham, above, Clive Sheridan with the statue and Fr Michael Johnstone talking to Premier Radio on Skype. Images by Clive Sheridan.